Carla Wennberg, coach of the 2013 Intercollegiate Horse Show Association reserve national champion western team from St. Andrews University in Laurinburg, N.C., offers some advice to help you teach and reinforce neck reining. 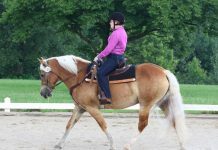 Equipment: Remember that your hand guides your horse’s shoulders and neck. Your leg and seat guide the rest of the body. Don’t use draw reins or any kind of artificial aid that you don’t need. Anything that holds the head down, such as martingales, can take away from guiding the neck. Walk the pattern: Get everything worked out mentally so you’re clear when you communicate with your horse. Whether you’re preparing to ride your horse in simple squares or complex horsemanship patterns, don’t underestimate the benefit of walking your pattern on foot first. This can help you understand where you’re going and how you’re getting there. Leg aids: Circles are a great way to reinforce your leg aids. Control your circle with your outside and inside legs to keep your horse supple and in a correct bend. Keep his ribcage up and don’t allow him to fall in. Spiral in: Start on a 20-meter circle at the jog. Using your neck reining skills, spiral your horse into a 6- or 8-meter circle and then spiral back out. Think of keeping his shoulders and neck straight. Don’t drop your shoulder to the inside. 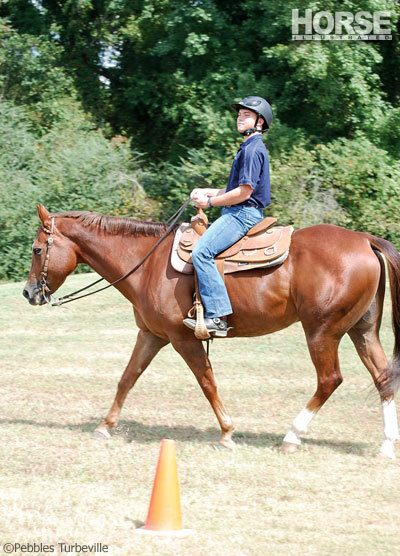 You’re not keeping a lot of bend in your horse; he’s actually going to stay fairly straight. If you have issues with the spiral, remember to focus on your leg aid; that’s what controls the horse’s movement.